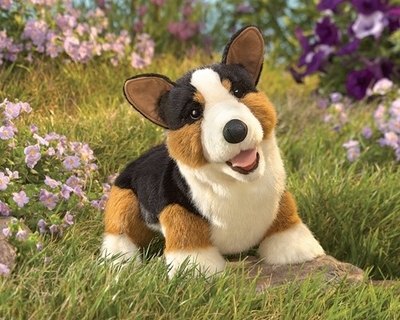 Folkmanis 3089 - A diminutive dog fit for royalty, the Folkmanis® CORGI puppet awaits your adoption. A tri-colored Pembroke in black, brown and white, this stocky pooch is the perfect companion for creative play. Movable mouth. Measures 17” long, 8” wide, 11” tall.